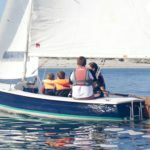 Our Laser 16 is an excellent day boat that sails well and is a large dinghy. 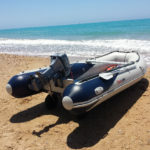 Those who hire this boat will benefit from a fully retracting centre plate, plenty of room in the cockpit, outboard mount and a large sealed forward locker. It is capable of sailing with five persons but also easily sailed single handed in lighter winds. As there is a risk of capsize with this boat it must have the outboard stowed when sailing.